What's the precautions of using the Rotary Evaporating Water Bath? Laboratory rotary evaporator is a device for purifying distillation experiments.The rotary evaporator make the flask in the negative pressure state through the vacuum pump,The flask was heated while being placed in a rotary steaming bath , and the solution in the flask was subjected to heat diffusion evaporation in a rotating flask under a negative pressure.In other words, the film is formed by rotating under negative pressure through constant temperature heating, and then recovered by condensation after highly efficient evaporation to achieve the effect of purification and separation. 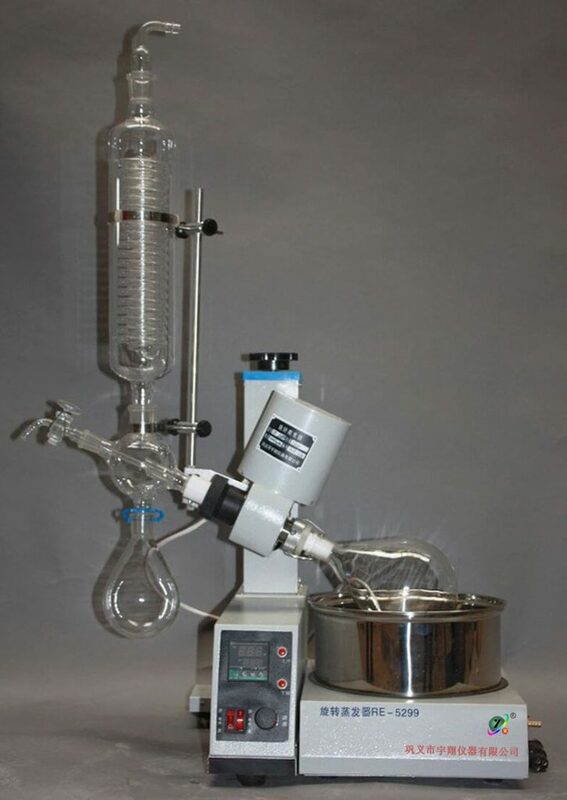 The matching products of rotary evaporator contains vacuum pump and cooling pump.and the vacuum pumps are available in a variety of types,such as table circulating water vacuum pump,vertical circulating water vacuum pump,Diaphragm vacuum pump,and rotary-vane vacuum pump.Customs can choose suitable pump for rotary evaporator according to your requirement. 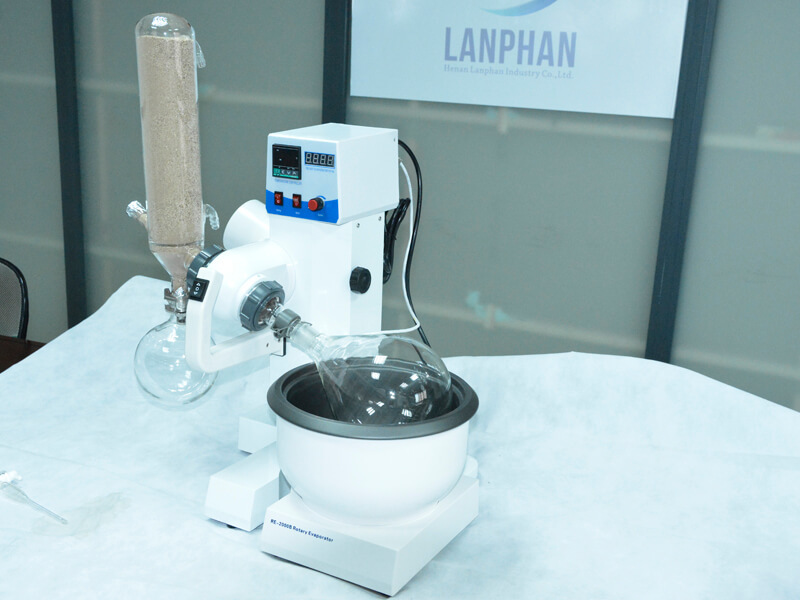 The main parts of the rotary evaporator contains glass condenser pipe,rotary motor,water bath,distillation flask,receiving flask and other glass fittings.We have discussed the importance of the condenser and ways to clean the glass fittings.Today Lanphan will tell you the precautions of using the rotary evaporating water bath. 1. Please raise the sample bottle of the rotary evaporator to the highest point before the experiment. 2. Place the water bath of the rotary evaporator in the center of the sample bottle. 3. Lower the host of the rotary evaporator slowly. 4. Lower the height of the device and place the sample bottle in the rotary evaporating water bath,add water into the rotary evaporating water bath according to the capacity of the sample bottle,but not to add too much water,generally 2cm to the bottle edge.when add water,don’t poured in the flask,add slowly from the edgeways. 5. Make sure the power switch of Laboratory rotary evaporator and the power switch of the instrument host are turned off and then plug the power plug into the socket. 6. Reduce the steamed sample bottle to the lowest part. 7. Don’t splash water in the electrical box to avoid leakage and damage the electrical components. 8.If the indicator light is not on,disconnect the power supply,pluck out the plug and disassemble the board on the right side. If the fuse wire or indicator bulb is damaged,replace it withe the same specification. 9.The inner surface of the equipment shall be free from moisture, and the outer surface of the equipment shall be bright and clean without stains. 10.When the water bath is used,it must reliably grounded.water can’t be splashed into the control box. These are the places we need to pay attention to in the operation of the steaming water bath. Only by carefully obeying the regulations can we maximize the service life of the steaming. Lanphan Technology welcomes your inquiry! What capacity of the rotary evaporator or reactor needed to match the DLSB Low Temperature Cooling Liquid Circulating Pump?